This grill really looks nice. The stainless steel is nicely polished and the unit is large (there is a larger one for about $1,000). There is a lot of cooking space, a side burner, infrared searing burner, full rotisserie with rear mounted infrared rotisserie burner and even a cover. 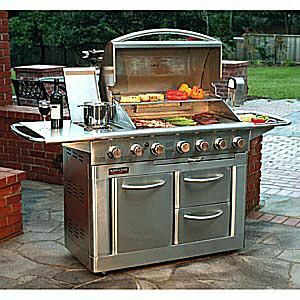 This is another Chinese imported stainless steel grill that looks great and provides a lot of features. The grill is built from 304 stainless steel, but the barrier and burners are light weight and thin. This grill really looks nice. The stainless steel is nicely polished and the unit is large (there is a larger one for about $1,000). There is a lot of cooking space, a side burner, infrared searing burner, full rotisserie with rear mounted infrared rotisserie burner and even a cover. This Chinese made grill by Nexgrill has all the bells and whistles you could want, but lacks quality in the overall construction and relies on thin metal components. The problem with this grill, like many of this type, is that a lot of attention has been paid to the appearance and the features. For the size, this grill should produce more heat than 40,000 BTUs from its four main burners. You will need to use the 18,000 BTU searing burner to really get this grill up to temperature. But the biggest problem is the same with many of the Kirkland grills, the assembly is weak. I know several people who are perfectly happy with these grills. I have also heard stories of this unit being returned for assembly mistakes that caused big problems. The cart construction is not great and detracts heavily from the overall unit. At nearly $1,000 one should really get a better built grill. On the plus side there is a full cover for the grill so you don't have an excuse to let it sit out in the elements, Also, Costco has been very good about taking returns and supporting this grill. Unfortunately, you shouldn't have to rely on the return policy for a grill.